In August 1914, з war started on the continent of Europe. It was the beginning ofa struggle that lasted for more than four years, brought death to millions of people and changed the history of the world. At the time people called the conflict the Great War. Later it was called the First World War. countries were Germany and Austria, who were called the Central Powers. Most Americans wanted to keep out of the war. They saw it as a purely European affair that was not their concern. When President Wilson said that they should be “impartial in thought as well as in action,” most people were ready to agree with him. But Americans found it difficult to stay impartial for long. In the first days of the war the German government sent its armies marching into neutral Belgium. T his shocked many Americans. They were even more shocked when newspapers printed reports-often false or exaggerated —of German cruelty towards Belgian civilians. 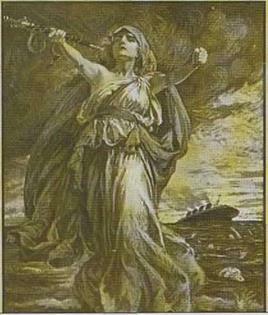 From the very beginning of the war the strong British navy prevented German ships from trading with the United States. But trade between the United States and the Allies grew quickly. By 1915 American factories were making vast quantities of weapons and munitions and selling them to Britain and France. German leaders were determined to stop this flow of armaments to their enemies. They announced in February 1915, that they would sink all Allied merchant ships in the seas around the British Isles. On a hazy afternoon in May, a big British passenger ship called the Lusitania was nearing the end of its voyage from the United States to Britain. Suddenly, without any warning, it was hit by a torpedo from a German submarine. Within minutes the Lusitania was sinking. More than 1,000 passengers went with it to the bottom of the ocean. One hundred and twenty-eight of those passengers were Americans. The sinking of the Lusitania made Americans very angry. Some began to think that Germany would do anything to win the war. But most still wanted peace. President Wilson made strong protests to the German government. For a time the Germans stopped the submarine attacks. In the autumn of 1916 American voters re-elected Wilson as President, mainly because he had kept them out of the war. in January 1917, Wilson made a speech to Congress. In it he appealed to the warring nations of Europe to settle their differences and make “a peace without victory.” This, he said, was the only kind of peace that could last. But by now American bankers had lent a lot of money to the Allies. And American military supplies were still pouring across the Atlantic. Germany’s war leaders feared that, unless the flow of supplies was stopped, their country would be defeated. Only nine days after Wilson’s speech they again ordered their submarines to begin sinking ships sailing towards Allied ports. This time the order included neutral vessels. When the Pilgrims arrived off the coast of America they faced many dangers and difficulties. They did not want to put themselves in further danger by quarreling with one another. Before landing at Plymouth, therefore, they wrote out an agreement. In this document they agreed to work together for the good of all. The agreement was signed by all forty-one men on board the May­flower. It became known as the Mayflower Com­pact. in the Compact the Plymouth settlers agreed to set up a government —a “civil body politic —to make “just and equal laws” for their new settle­ment. All of them. Pilgrims and Strangers alike, promised that they would obey these laws. In the difficult years which followed, the Mayflower Compact served the colonists well. It is remem­bered today as one of the first important docu­ments in the history of democratic government in America. The Pilgrims’ ship was an old trading vessel, the May flower. For years the May flower had carried wine across the narrow seas between France and England. Now it faced a much more dangerous voyage. For sixty-five days the May flower battled through the rolling waves of the north Atlantic Ocean. At last, on November 9, 1620, it reached Cape Cod, a sandy hook of land in what is now the state of Massachusetts. Cape Cod is far to the north of the land granted to the Pilgrims by the Virginia Company. But the Pilgrims did not have enough food and water, and many were sick. They decided to land at the best place they could find. On December 21, 1620, they rowed ashore and set up camp at a place they named Plymouth. 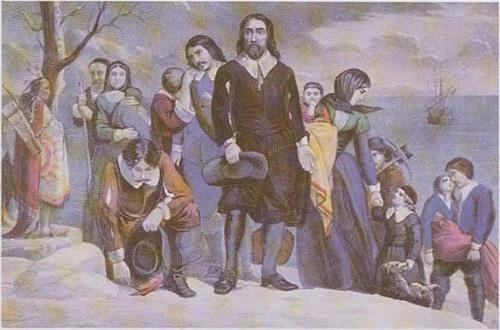 “The season it was winter,” wrote one of their leaders, “and those who know the winters of that country know them to be sharp and violent with cruel and fierce storms.” The Pilgrims’ chances of surviving were not high. The frozen ground and the deep snow made it difficult for them to build houses. They had very little food. Before spring came, half of the little group of a hundred settlers were dead. But the Pilgrims were determined to succeed. The fifty survivors built better houses. They learned how to fish and hunt. Friendly Amerindians gave them seed corn and showed them how to plant it. It was not the end of their hardships, but when a ship arrived in Plymouth in 1622 and offered to take passengers back to England, not one of the Pilgrims accepted. 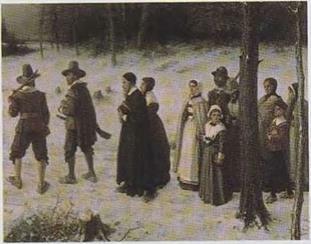 Other English Puritans followed the Pilgrims to America. Ten years later a much larger group of almost a thousand colonists settled nearby in what became the Boston area. These people left England to escape the rule of a new king, Charles 1. Charles was even less tolerant than his father James had been of people who disagreed with his policies in religion and government. The Boston settlement prospered from the start. Its population grew quickly as more and more Puritans left England to escape persecution. Many years later, in 1691, it combined with the Plymouth colony under the name of Massachusetts. Winthrop. “The eyes of all people arc upon us.” To this day many Americans continue to sec their country in this way, as a model for other nations to copy. The Puritans of Massachusetts believed that governments had a duty to make people obey Cod’s will. They passed laws to force people to attend church and laws to punish drunks and adulterers. Even men who let their hair grow long could be in trouble. Roger Williams, a Puritan minister in a settlement called Salem, believed that it was wrong to run the affairs of Massachusetts in this way. He objected particularly to the fact that the same men controlled both the church and the government. Williams believed that church and state should be separate and that neither should interfere with the other. Williams’ repeated criticisms made the Massachusetts leaders angry. In 1535 they sent men to arrest him. But Williams escaped and went south, where he was joined by ocher discontented people trom Massachusetts. On the shores of Narragansctt Bay Williams and his followers set up a new colony called Rhode island. Rhode island promised its citizens complete religious freedom and separation of church and state. To this day these ideas are still very important to Americans. William Penn signing a treaty with the АнкттЛагн. Charles П, Penn was the proprietor, or owner, of Pennsylvania. 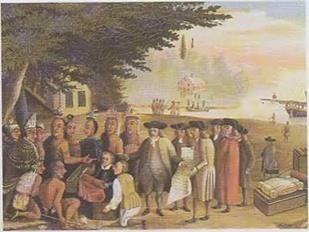 Penn belonged to a religious group, the Society of Friends, commonly called Quakers. Quakers refused to swear oaths or to take part in wars. I’hcsc customs had helped to make them very unpopular with English governments – When Penn promised his fellow Quakers that in Pennsylvania they would be free to follow their own ways, many of them emigrated there. New York had previously been called New Amsterdam. It had first been settled in 1626. In 1664 the English captured it from the Dutch and rc-nanted it New – York. A few years later, in 1670, the English founded the new colonies of North and South Carolina. The last English colony to be founded in North America was Georgia, settled in 1733. Ram pouring down in torrents. Ran my horse into a ditch and got my knee badly sprained. Brazos River. Swam our cattle and horses and built raft and rafted our provisions and blankets and so on over. Swam river with rope and then hauled wagon over. Lost most of our kitchen furniture, such as camp kettles, coffeepot, cups, etc. Stampede last night and a general mix up and loss of beeves [cattle]. Hunt cattle again. Men all, tired and want to leave. Hard rain and viral storm. Beeves run and I had to be on horseback all night Awful night. Men lost. Quit the beeves and go hunting men. Found our men with Indian guide and 195 beeves 14 miles from camp. Almost starved not hatnng had a bite to eat for 60 hours. Got to camp about 12:00. Tired. Arkansas River. 15 Indians came to herd, and tried to take some beeves. Would not let them. One drew his knife and I my revolver. Made them leave, but fear they have gone for others. But Spain and China seemed far away. Most Americans ignored Roosevelt’s warning. They believed that the best thing to do was to let foreigners solve their problems themselves. Isolationists felt this particularly strongly. These were people who believed that Americans should try to cut off, or “isolate,” the United States from the problems of the outside world. Isolationist ideas were very strong in Congress during the 1930s. It passed a number of laws called Neutrality Acts. These said that American citizens would not be allowed to sell military equipment, or lend money, to any nations at war. 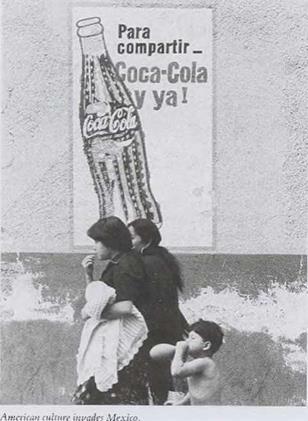 Even non­military supplies such as foodstuffs would be sold to warring countries only if they paid cash for them and collected them in their own ships. Then, in 1939, war broke out in Europe. By the summer of 1940 I Iitlcr’s armies had overrun all of western Europe. Only Britain — exhausted and short of weapons —still defied them. With Hitler the master of Europe, and his ally, Japan, becoming ever stronger in Asia, Americans saw at last the dangerous position of the United States, sandwiched between the two. 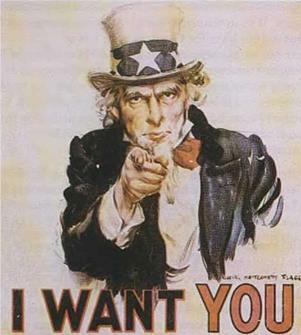 Roosevelt had already persuaded Congress to approve the first peacetime military conscription in American history and to suspend the Neutrality Acts. Now he sent Britain all the military equipment that the United States could spare —rifles, guns, ships. Early in 1941 the British ran out of money. In March Roosevelt persuaded Congress to accept his Lend Lease Plan.